and between both, my life moves"
Accounts/Credit Control related jobs since 1996 including senior and team leader roles in finance/credit control positions. "The Black Forest" in 2009 published by Unistar. "Life is what you make it. Live your dreams and create your own unique story. Inspire and be inspired"
"Use negative events as life lessons, always learn and use that energy as fuel into something productive so you can gain a positive from a negative situation"
"In darkness, creation is born"
"The five things in life that will assist you in life, is believe in yourself, take action, problem solve, take time to love people that love you, cut your losses from the insolvable"
Karina Sher was born 1st October 1980 in Leicester, United Kingdom. Her name Karina means "Of Songs" and "Pure Hearted" whilst her last name originates from India, meaning "Lion"
Karina started to write poetry and short stories from the age of 8, later to become a published poet with her first book "The Black Forest" being published by Unistar. At a very young age, Karina was able to perform as an actress being involved in many plays at a very young age and joined her first ever rock band at 14 years old in a band called "Neutral Shade"
It was through the band's first demo, she was signed as songwriter and artist to HTT Records Ltd. The band Neutral Shade dissolved later to form midlands underground metal band "Mindlapse" which received KKKK in Kerrang Magazine, features in Metal Hammer and a live interview with Malcolm Dome with Total Rock Radio. Performing in venues such as Rock City in Nottingham, Camden Koko and Bradford Rio, the band successfully performed with many signed artists such as Napalm Death, Kill II This, Insomnium, Cancer and Skindred just to name a few. During this time, she also put on shows and clubs for the underground rock and metal circuit in the midlands via her promotions company Ragebreed and as a managing director and operating the business where she has also interviewed big stars, djyed big club nights and festivals in De Montfort Hall and also held big events and tours with high profile artists. She is continuing the Ragebreed brand with ocassional club nights and events. Ragebreed Ltd is a proud supporter of PPL PRS Ltd. Although being very creative, Karina is also very fond of mathematics and academia. From 1996, she also learned accounts work ranging from credit control, sales ledger and purchase ledger, payroll, various accounts functions and managing teams. She is currently learning business management and accounting to advance her skills along with studying CIMA. She has certification in SAGE, HR & people management, book keeping along with key account management. Having been a finance team leader, she has implemented policies to manage the finance function and has managed small to large teams with positive feedback and won various awards for diligent and excellent hard work. She currently works in the finance department for PPL PRS Ltd responsible for licensing TheMusicLicence to businesses, media, clubs and venues. Karina also dabbles in part time graphic design work and also creates art which you can view samples on her Facebook page. She has been recognised as one of Leicester's top artists for being orginal in surreal abstract genre and has been featured in Aspire Magazine. She also dabbles in website building also. She is currently working on a solo project called "Lake Of Dreams" which has received label interest and has recorded an EP which is available to buy on Itunes or streamed via Spotify. 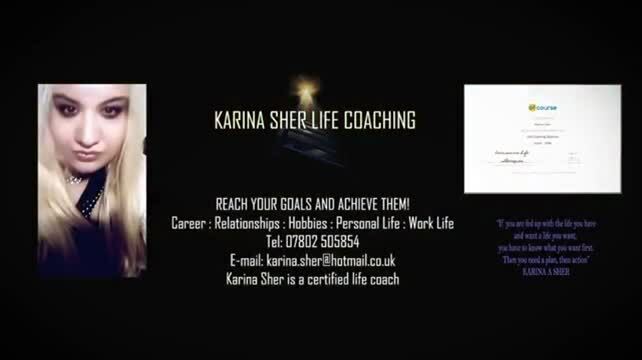 Karina has a part time business in life coaching and is also certified in other holistic & spiritual practices to assist people heal and reach for their goals. She is proud to see the significance in mind, body and spirit and to create a life path right for you. She has helped many clients that have given her excellent feedback. She does believe in holistic and conventional medicine and uses both to heal herself and others. Karina is also a dedicated vegan and hopes to release her book "Veganize My Life" next year giving recipe ideas which have assisted her with weight loss. She believes in a balanced life where there is convention and unconventional living due to her outside the box thinking. Although she has a bohemian and creative side, she is very much grounded, logical and a realist and has a way of making her dreams into reality by setting goals, believing in herself and taking action on things she feels are right for her. The main things she believes are important in life is the bonds between family, friends and loved ones. She also has good bonds with animals and children but she also believes in living an authentic life. She likes a balance of city and country life and doing the things she is passionate about is important to her. She has a material and spiritual philosophy. Karina is authentic, spiritual and transparent to the core and very goal orientated as she believes she is following a path that is right for her. She believes in taking baby steps towards her dreams and being positive and by this approach, she has been able to make a few dreams come true as puts great importance in promoting self belief and self promotion. In doing so, she inspires others to do the same and has proven to be a successful leader, manager and life coach. KARINA SHER "VEGAN EATING HAS CHANGED MY LIFE"
Karina Sher decided to embark on Vegan eating in October 2016 and has enjoyed the transition so much that she is currently writing a recipe book and hopes to release it in 2017/2018. Above some of the foods she will be including in the recipe book. She will also be creating a site to see how good vegan eating can be and how to enjoy cruelty free food. Not only does she have a guilt free conscious but she also has lost 2 and a half stones since switching to vegan eating. "There are many substitutes for meat, fish, milk, butter, cheese and even egg now. I think it's about awareness. I would rather the food I put in my mouth hasn't harmed an animal in any way." Animals were not born to be locked up and then slaughtered for our consumption. Human beings are simply not actual predators. We don't go and tear an animal in cold blood and rip it apart and eat it raw. Predators do that like lions for example. We have to cook the food to eat it. Dairy milk comes out of a cow for their young not for human beings. You can gain all your protein and vitamins on a healthy vegan diet with mock meats and with dairy free products plus you stop animal cruelty. I sleep with clear conscience because ethics come over ego and good vegan food tastes amazing. Lake Of Dreams self titled EP is now available to buy. Please click here to purchase the online release for just $5.94 only! Click above picture to buy the full Mindlapse album via Itunes for $9.99 only! Karina Sher was selected as one of the top 10 artists in Leicestershire and published in Aspire Magazine due to being "outside of the box" with her abstract surrealism.